These modern living room ideas range from stunning minimalist to elegant rooms with a more luxury feel. 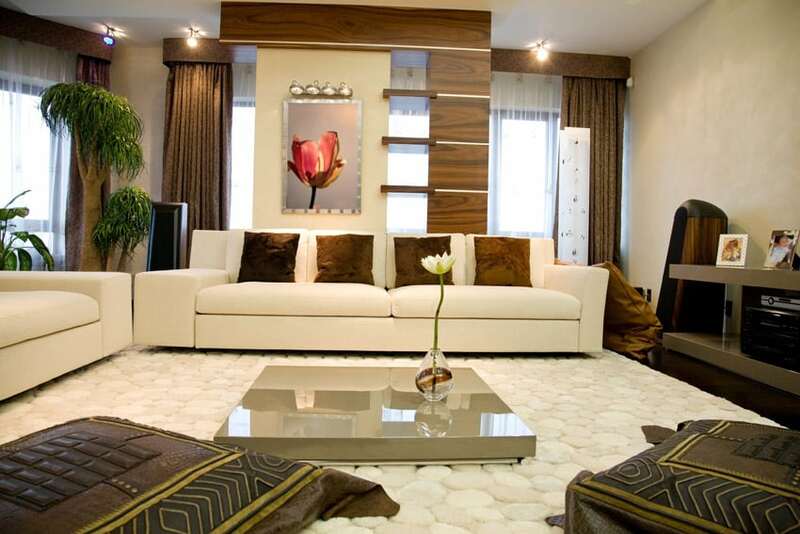 Below you’ll find a variety of modern living room deigns to offer you a wide range of furniture, colors and patterns. 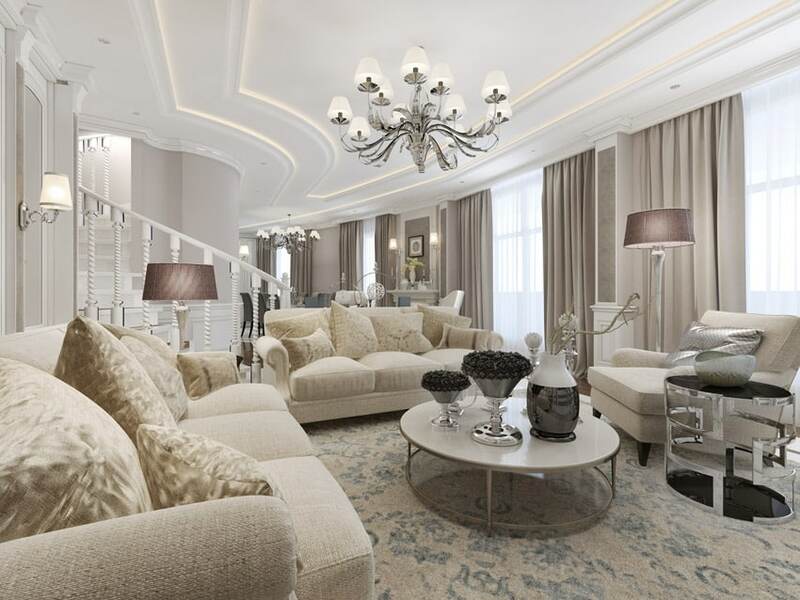 From formal sitting areas, to relaxed entertaining areas the interior design pictures in this gallery provide plenty of luxurious living room layouts. 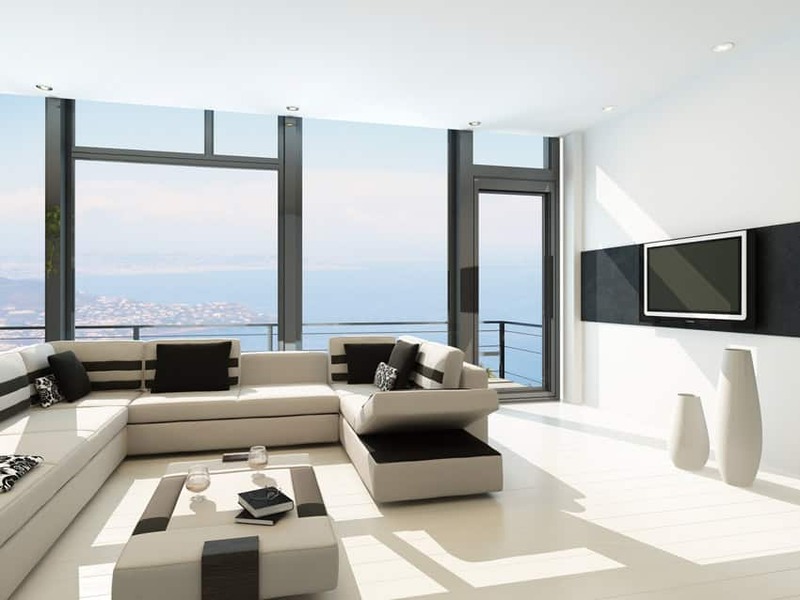 Above is a minimalist modern living room with a black & white color scheme. There is play in different textures in this design – you will see that the fabrics used have prominent and varied textures. On the walls, you will also see a play in textures – walls are matte black while the round columns were painted in a glossy black paint. There is even an electric fireplace in the middle made with stainless steel cladding. The warm colored lights used in the space helps soften up the look and make it warmer and more inviting. 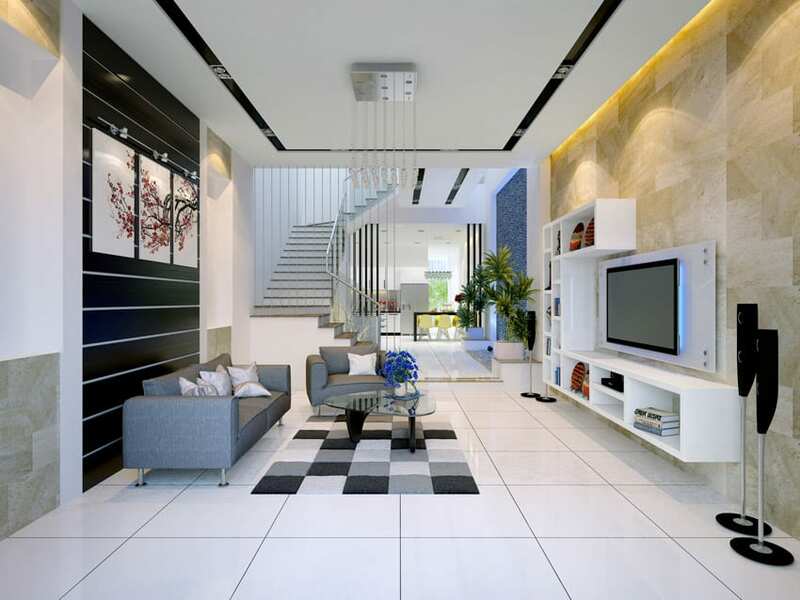 Theme: A modern home is seamlessly fused together by a lot of different elements. 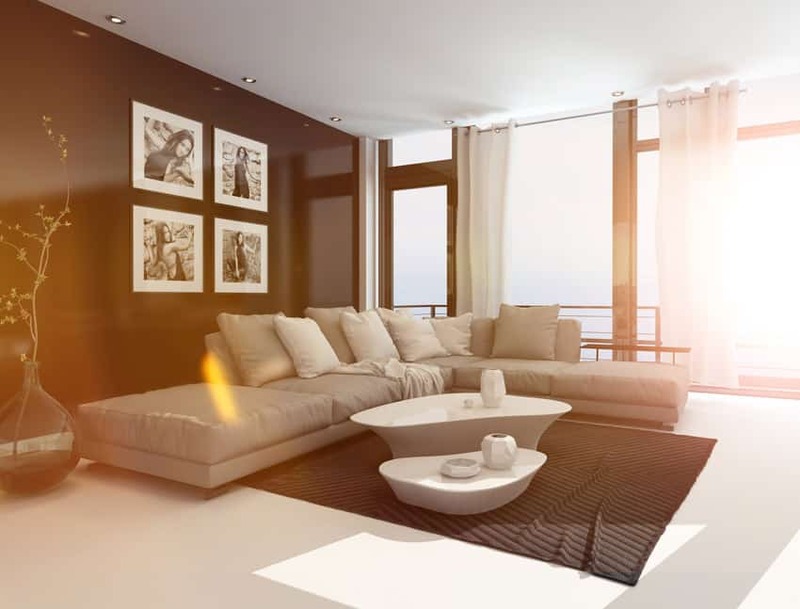 From an ultra chic modern décor dominated by stone textures and black & white color tones to a warm and minimalist Asian zen décor, there are a lot of varied themes to choose from while planning a modern living room for your home. So firstly, pick the theme of your modern décor and work towards it by putting together all the other elements. Color Palette And Textures: A modern living room is often defined by its minimalist look. Nothing over the top in terms of colors or textures is seen dominating a modern living room. That said, a modern décor can have a lot of varied looks, each one retaining the underlying modernistic theme in its own unique ways. And a lot of it is contributed by the change in color palettes and textures. 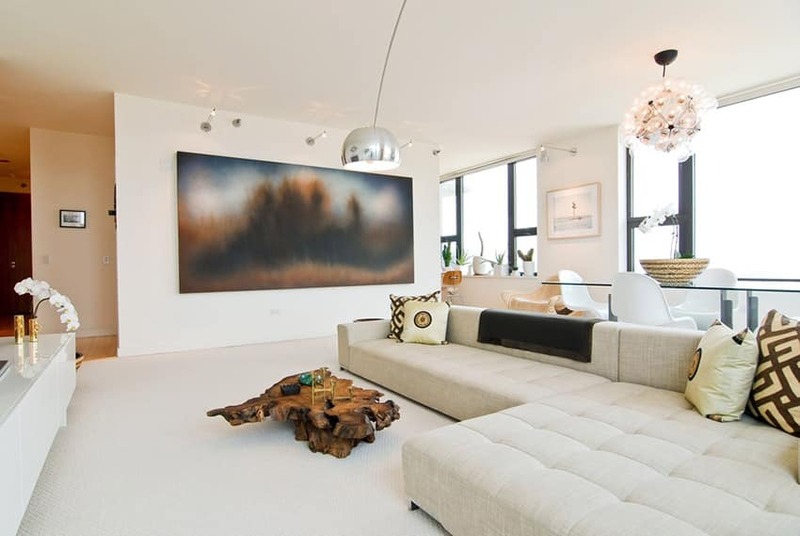 A modern living room uses softer and muted tones in most of its style. A black and white home brings in an upscale yet minimal appeal while warm tones like browns and beige sets a neutral background. Specific use of textures like stone, glass, wood, leather and marble in bits and pieces around the living room instantly adds a mod appeal to a space. Modern Furniture: Furniture plays a very important role in setting up the look and feel of a place. So if you are trying to achieve a modern living room décor, you can’t go wrong while choosing the furniture for your living room. Furniture belonging to the modern era is one of the most loved ones by design and décor enthusiast. For a living room that exudes a modern look, you can choose from mid-century modern furniture styles that feature raised legs and clean, straight lines. A similar type of modernistic design is also inherited by the Scandinavian furniture designs. Minimalism lies at the core of modern furniture and hence their simple yet ultra chic look takes center stage in any room that they are placed. You can play around with their combination and even add a touch of classics to your décor. Contemporary Accessories: A space receives finesse with the right kind of accessories. 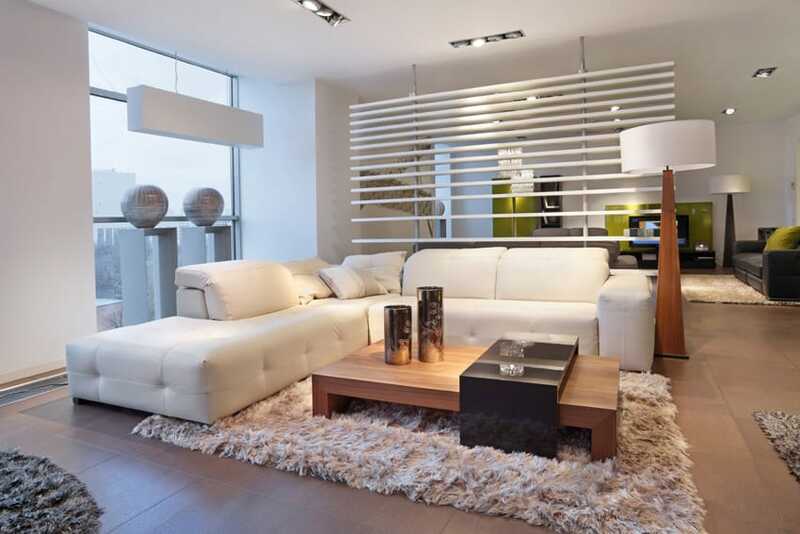 Show your attention to detailing by opting for modern décor accessories that rightly supports your modern living room. For the walls, abstract and modern paintings, sketches or portrait photographs would add the right bit of modern elegance. Do not forget to place statement-making accessories like metal lamps, ceramic structures, vases, glass chandeliers etc to add the required visual appeal to your living room. This modern tropical living room blends neutral colors with warm browns, creating a relaxing and laid-back ambiance to the space. The floors are engineered cherry wood, paired with light yellow walls and an accent wall painted in a matte light mocha brown color. Because the walls and floors are already dark, the furniture used is in light cream, making it stand out from the wall and floor surfaces. You can also see stone cladding applied on columns to add texture, as well as indoor plants to add a pop of color into the space. This space is a modern transitional living room, with a bold combination of colors, yet still maintaining a balance and an easy-on-the eyes appeal. The floors are light maple wood paired with white walls and antiqued metallic wallpaper. Furniture pieces is a combination of classic and modern. A large modern L-shape sofa in teal is the main accent piece, paired with a neo-classic style coffee table and modern media console. Accentuating the living area is a rawhide rug and a unique crystal chandelier with etched glass right above it attached on the ceiling, helping reflect back the light onto the floor. Scandinavian Modern furniture pieces often create a clean and casual look to any living space, and at the same time, makes it look fun and perfectly “instagrammable”. In Scandanivian modern designs, the furniture pieces themselves take center-stage, therefore, the surfaces are kept plain and clean – light beech wood floors & pale cream walls. This is paired with light-colored furniture pieces with light wood finishes and unique organic forms. Using a very minimalist modern aesthetic, this living room is only furnished with one sectional sofa in a light cream color with plain white walls and wooden floors. The large artwork on the pain white wall adds a pop of color to the space, as well as the built-in fireplace at the corner. 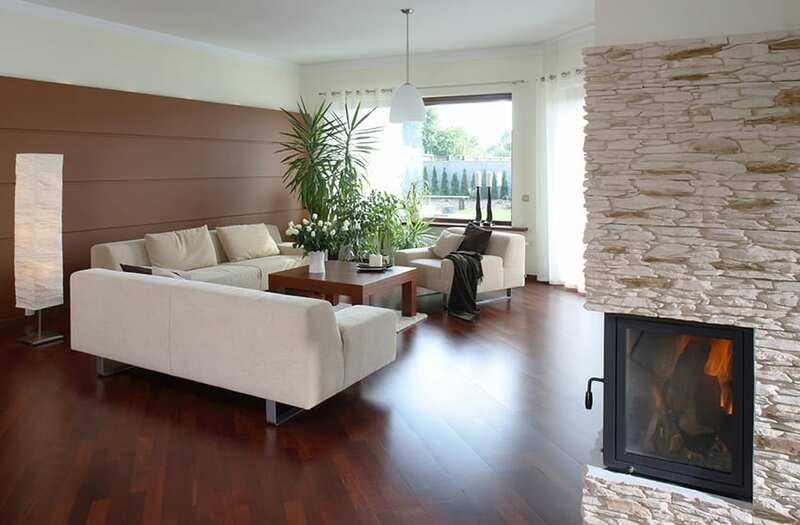 A cozy modern living room with a combination of warm brown tones and white creating a pleasing balance and contrast. The walls are plain white, combined with textured accent wallpaper in a warm mocha color which matches the color and texture of the blinds used. For the furniture pieces, white is the color of choice, combined with glass to add a reflective element to the space and a matching white area rug to frame and soften up the living area. This modern living room plays around with rough-looking patterns and textures, creating a grungy background. Walls and floors are both in gray, creating a semi-dark, muted background, helping the white sectional leather sofa stand-out. There are also some wood elements seen in this room, and all are in dark wengue finish. 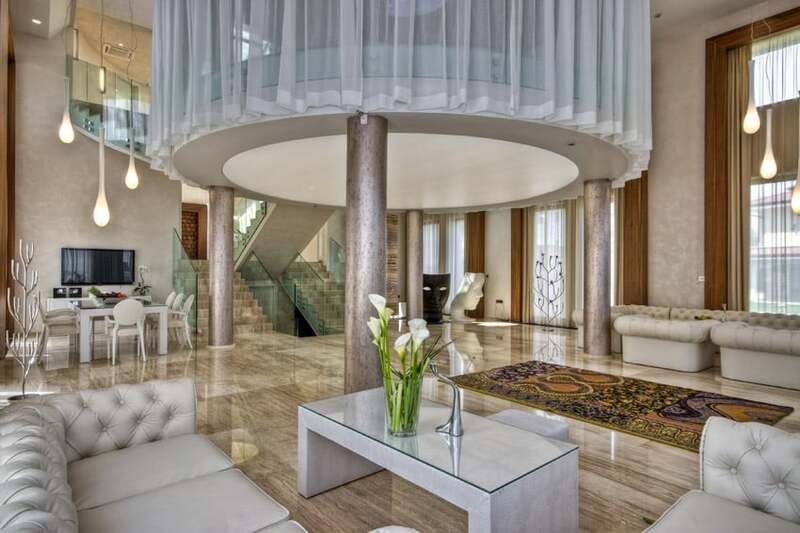 With high ceiling and luxurious materials, this modern living room is not only massive, but also has a grand feel. Walls are all covered in a unique finish of wallpaper in a taupe color and paired with porcelain tiles for the floors. There’s a circular loft area with glass railings overlooking the living area but is covered with sheer curtains. 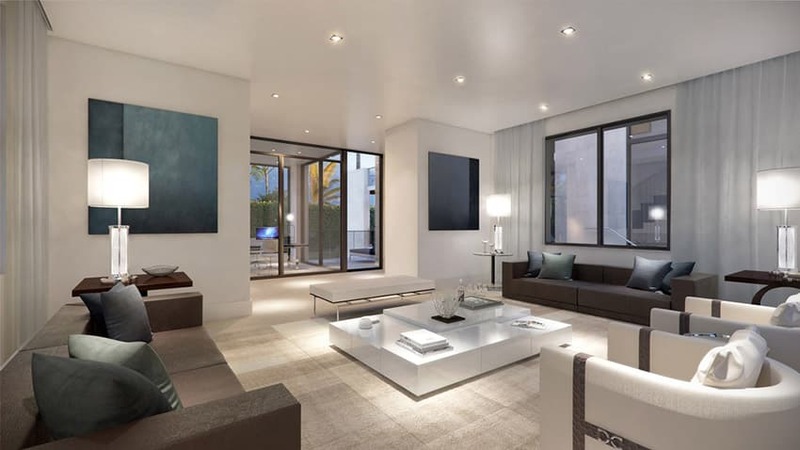 For the living room itself, the size of the space allows 2 living areas with still enough open space in between. Both areas were furnished with chesterfield sofa & armchairs in a light beige leather upholstery, paired with concrete finish coffee table with tempered glass top. The combination of elegant materials and the scaling of the space really gives the place a hotel-like feel. This small modern living room has a retro feel because of its color combination of choice of furniture pieces. 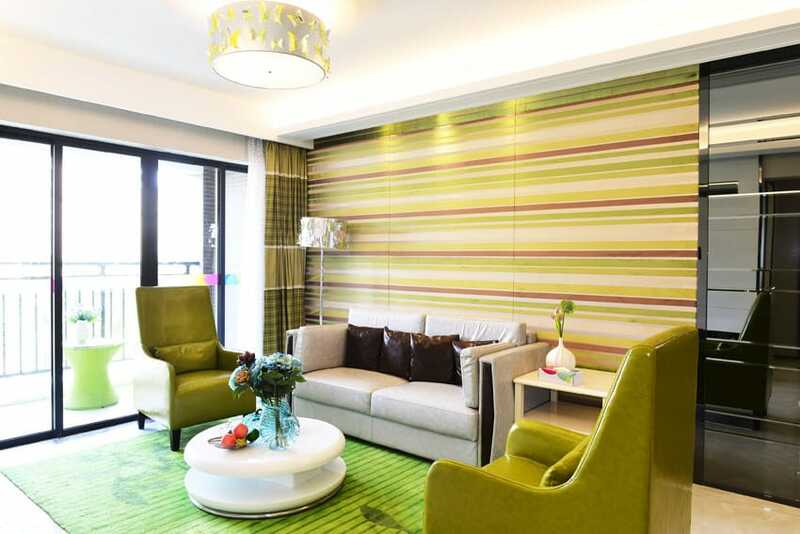 Most surfaces are kept plain white, but the accent wall had 3 acoustic panels covered with striped fabric with 3 different shades of green and a mauve accent. This striped pattern of the walls continues the horizontal stripe on the curtain panels, and as for the furniture, Retro style mid-century modern pieces were used like the white leather love seat, the pair of green high back chairs and the round high gloss coffee table at the center. Large window openings overlooking the pool area gives a relaxed feel to this modern living room. With plain cream walls and white homogeneous floor tiles, the light background allows the use of darker furniture pieces such as the black leather lazy boy sofa, the pair of upholstered swivel armchairs with chevron patterns and the dark wengue finish of the wood pieces. 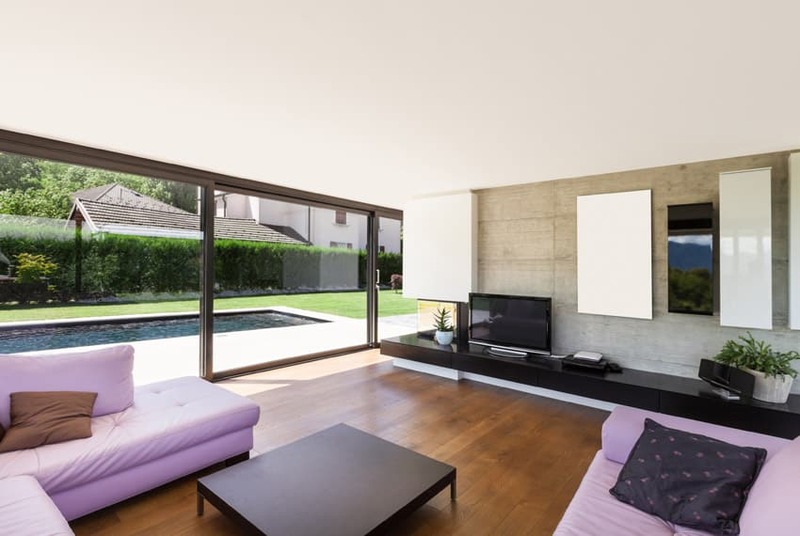 Large sliding doors which opens up the living and dining area to the pool are makes this space look brighter and more spacious. For the interior finishes, basic colors were applied on walls and floors – white ceramic tiles for the floors and light beige paint for the walls. There are no moldings on the walls, creating a clean & crisp lines, emphasizing the modern look of the space. As for the furniture, the living area only has an L-shaped sofa in a unique combination of black and white leather, with rawhide and velvet pillows. A formal living space with a very elegant appeal to it has it uses classic furniture pieces, creating a modern transitional space. The sofas used are classic scroll arm sofas upholstered in a light cream linen fabric which matches the armchair. It has a round modern coffee table with white ceramic top and stainless steel legs, matching with other stainless elements in the space like the side table and the chandelier. This minimalist modern living room is placed in a unique architecture with two sides of the wall with clear glass opening up to a gorgeous view of the sea. This gives an excellent natural illumination into the interiors, and of course, provides the space with a double stunning view. As for the finishes, solid horizontal wood slats were used running on the floors, to the walls and even up to the ceiling. The space is equipped with a modern electric fireplace and furnished with a pair of modern white sofas paired with a black coffee table. A combination of soft colors create a relaxing and laid-back look to this modern living room. It has a semi-open layout, dividing the living area & the dining with a sliding partition/door panels so you can close or open the two spaces for privacy at your whim. The living area has dark cherry wooden floors, light cream wallpapered walls, white ceiling and some light beech wood accents. The furniture pieces in the space is a large L-shape sofa upholstered in light cream linen, a classic scroll arm armchair in mocha fabric, a modern square stainless steel coffee table and matching stainless steel ceiling and floor lamps. A combination of modern and industrial style finishes create a unique look to this living room. 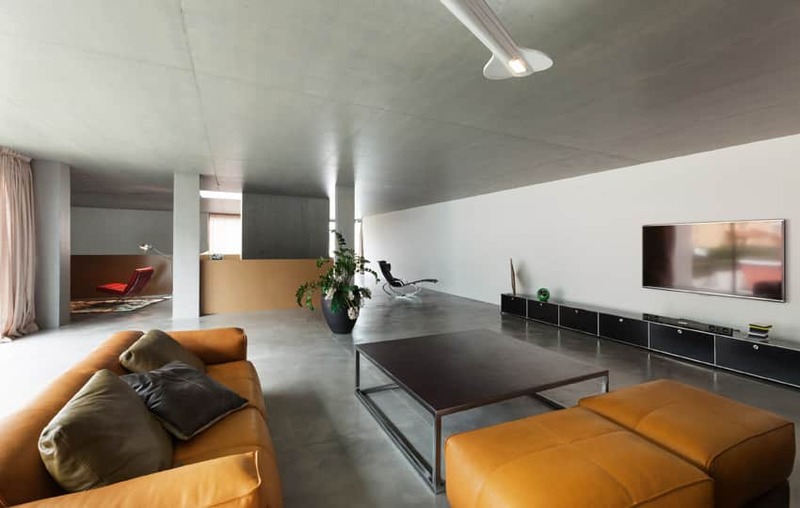 It uses polished concrete floors and ceiling paired with clean white walls, creating a more polished industrial feel to the space, with making it too dark or grungy. Furniture pieces are all modern, with sharp clean silhouettes and clean finishes – The sofa is upholstered in an orange leather fabric which matches the upholstery of the two large square ottomans. There’s a large square coffee table at the center with black matte top and stainless steel legs, matching the very long black media console by the wall. Overall, the space is note overly furnished, making it look big and spacious, yet still creating a good spatial balance. 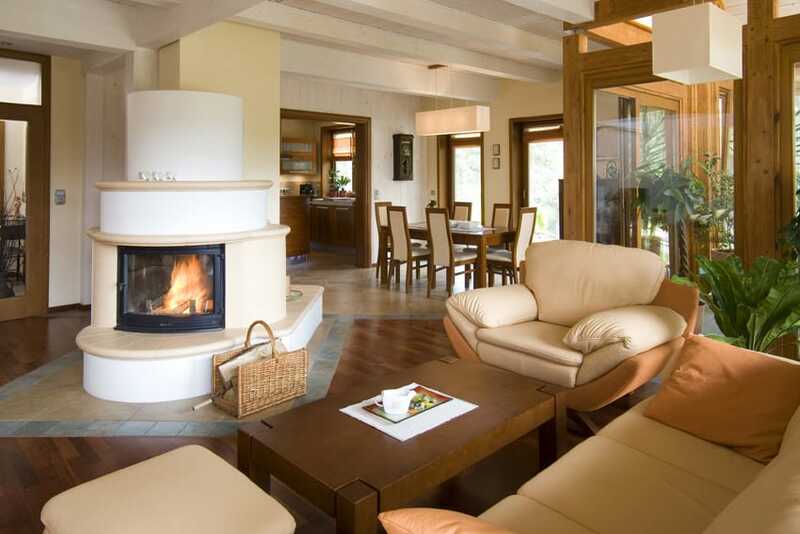 This living room features a unique layout and excellent combination of wood elements and greens. A fireplace was placed diagonally in a corner, creating a unique traffic flow. 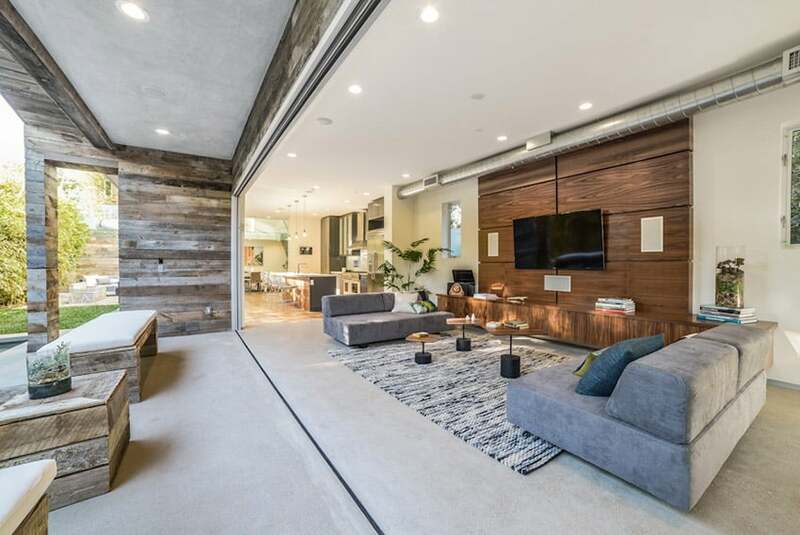 There are large windows and door openings framed with natural teak wood, creating a warm and natural feel to the space as well as providing excellent indoor lighting to the space. As for the furnishings, modern matching set of sofa, armchair and ottoman was used, with orange and beige leather upholstery and a wooden coffee table. There are indoor plants to help improve indoor air quality as well as the over-all natural ambiance of the space. 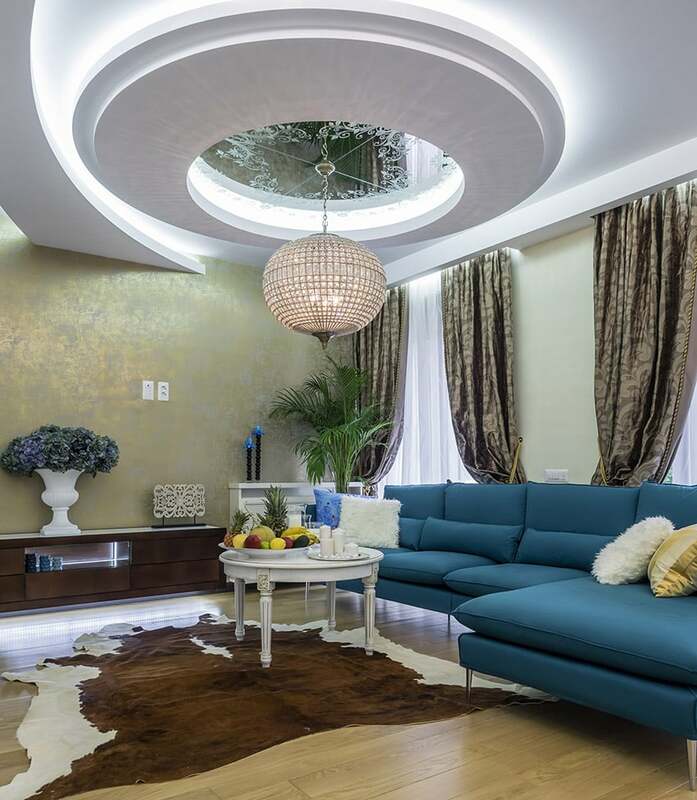 The high sloped ceiling of this modern living room helps make it look extra spacious and refreshing. Adapting a minimalist modern style also helps make it look more spacious as it only contains necessary furniture pieces. The sofa and the ottomans are a matching set with brown and white leather upholstery and a unique curved shape. 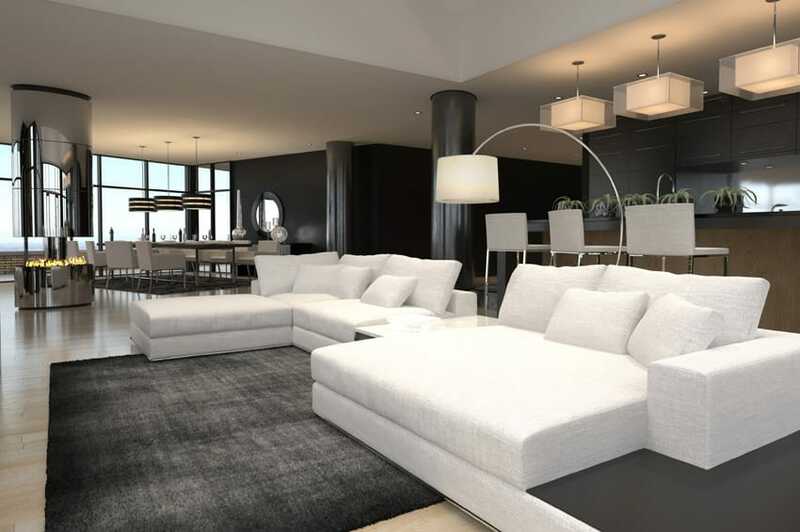 In the middle of the layout is a round high pile area rug and a modern glass coffee table. To help balance out the scale of the open spaces, various indoor plants with different sizes were used. 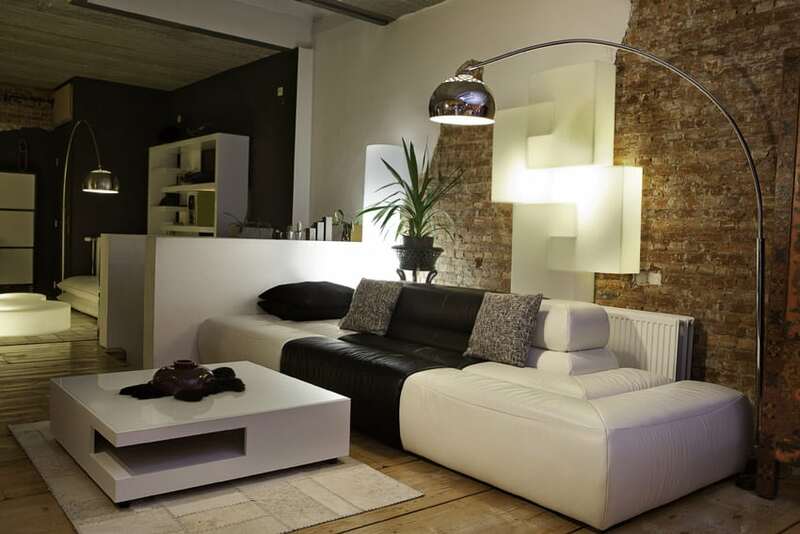 A small but lovely modern living room which combines simple furniture pieces with iconic modern furniture. It follows a simple cream, black and white color scheme which is easy on the eyes and has a timeless and gender-neutral appeal. Walls are textured cream color with an accent wall painted in black, paired with light ash floors. The TV is attached on a modular TV console with overhead shelves and cabinets. The furniture pieces used is are matching white leather sofas, an iconic black Le Corbusier LC4 chaise lounge and an equally iconic arched stainless steel floor lamp with marble base. Modern living room ideas with small layouts can appear larger by hanging curtains that help direct the eyes up and create the illusion of a larger space. 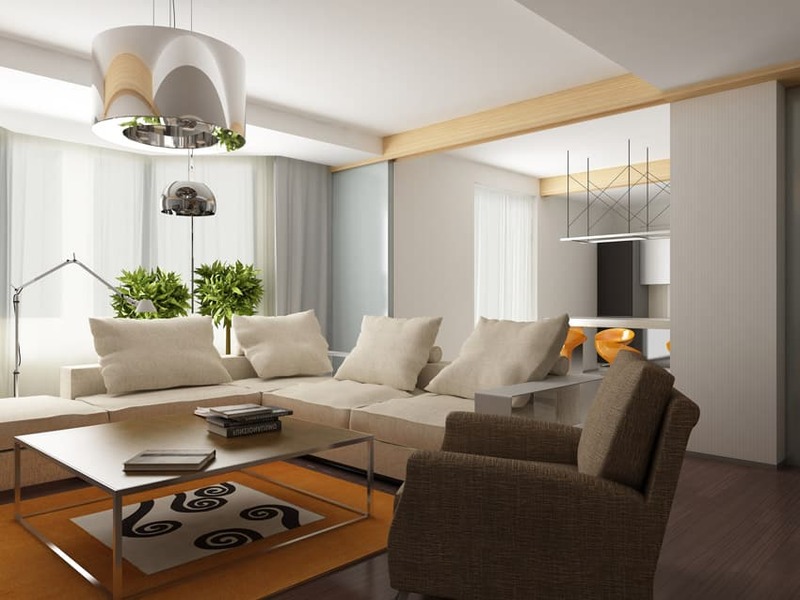 Furniture pieces such as glass tables or mirrors ca also reflect light and help a smaller layout appear more spacious. Most modern interiors are more conservative when it comes to color palettes, but this particular living room experiments a bit and uses a sectional sofa upholstered in lavender leather. The TV wall was clad in wash gray-white ceramic tiles with rough texture, giving it a concrete-like finish. It has a built-in ledge in dark wengue and modular cabinets in white and black. Solid teak wood floors help add warmth into the space and the large sliding doors not only gives a nice outdoor view, but also provides excellent natural light. A modern living room design with a touch of Asian-inspired pieces, this living room design is a great balance of minimalist modern furniture pieces and Asian-inspired accessories. As you can see, all furniture pieces are simple and modern, with off-white upholstery and stainless steel legs. Walls are white with large full-height windows and there are decorative niches for displays. The accessories such as the red vases placed on the niches, the red satin pillows, the beaded pillows and the indoor plants are small elements which help give the space more color and that Asian look. 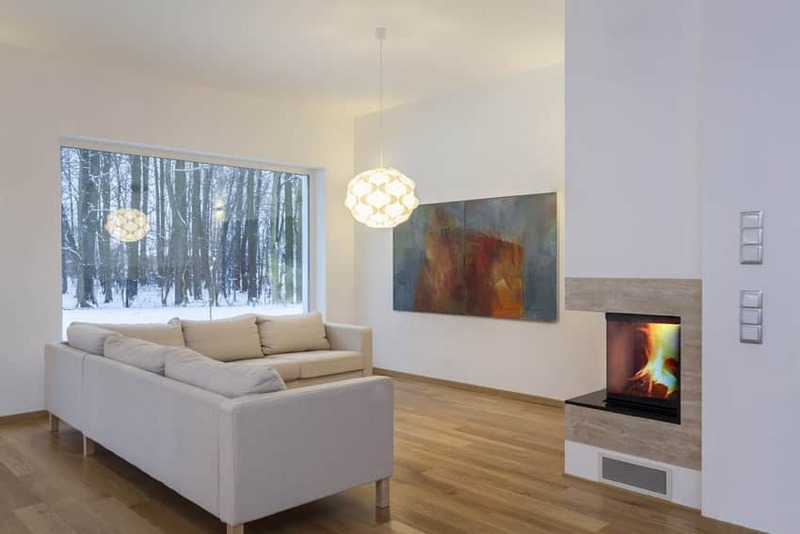 This is another minimalist modern Living room design which adds wood elements to add more warmth and personality to the space. With a large floor area, this apartment is able to have two living areas, in this picture you will see the formal living area or the receiving area, and visible at the back is more of the entertainment area. These two living rooms are divided by horizontal wood slats, which helps maintain that open floor plan look, while perfectly separating the two living areas. The formal living area uses an l-shape white leather upholstered sofa with wood laminated coffee table and a matching floor lamp and a high pile area rug. Most modern spaces opts to use plain white walls for its versatility. 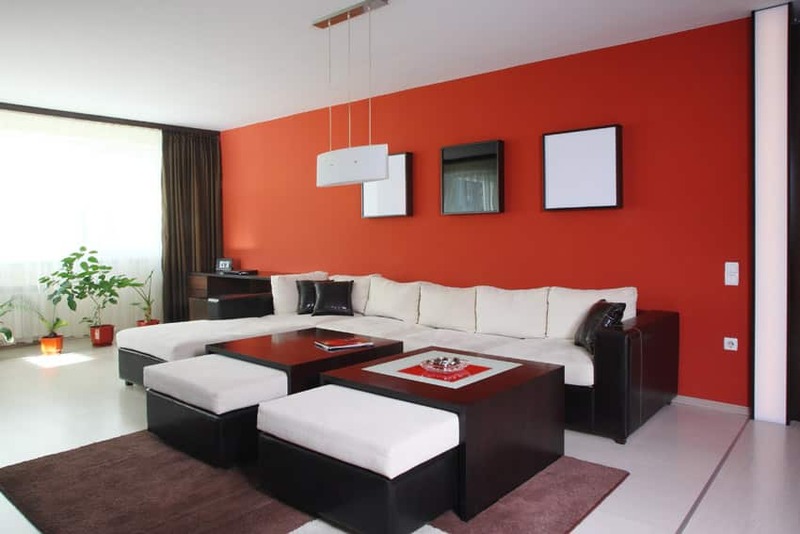 In this example you will see that the orange modern sofa and the dark brown leather sofa is balanced out by the bright white walls of the space. It also helps that there are lots of natural light in the space, creating a bright atmosphere. Contemporary living rooms often adapt color palette similar to this example. The combination of various tones of grays creates a clean monochromatic look, but adds textures on the walls and other materials to make it look more interesting. In this example, you will see that the gray painted wall is not a flat gray finish but has a marbled effect which mimics a concrete finish. The texture of the dark gray fabric used on the sofa is also very prominent and combined with the reflective finish of the table surfaces and the stainless steel legs. To get a softer look, light warm neutrals could be used as your color palette of choice. Using light oatmeal painted walls combined with light beige modern sofa & accent chair, this living room exudes a perfectly relaxed atmosphere. 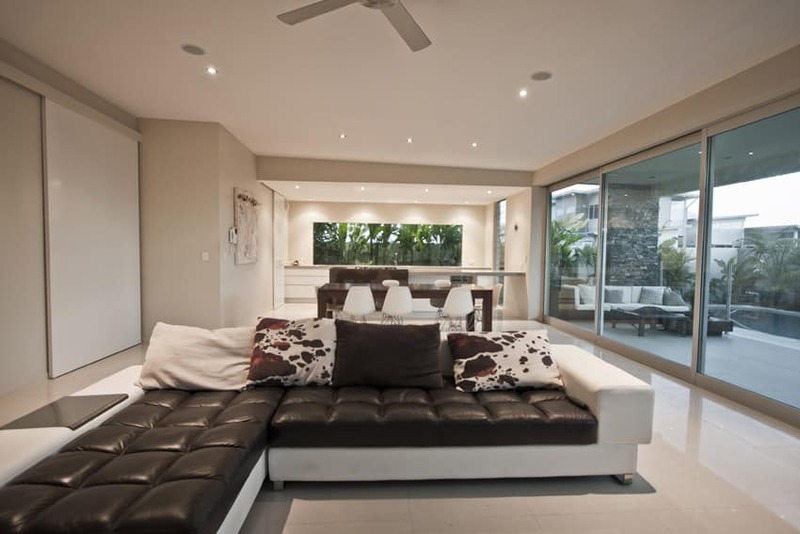 The large windows and doors also help contribute to this effect, as well as the soft throw pillows used on the sofa. There isn’t much accessories in the space to keep the minimalist look. 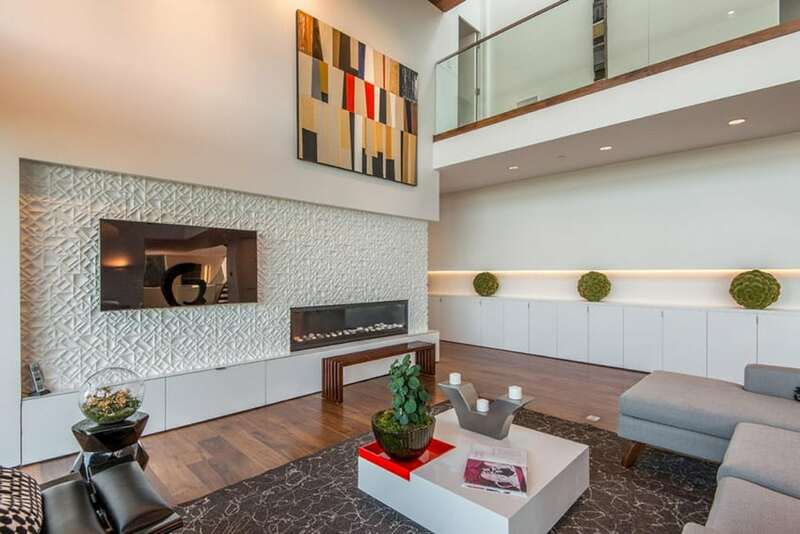 Despite the limited floor area, this modern living room looks wide and spacious because of the high ceiling. The light finishes also help make the space look bigger. The media wall cabinets all have a high gloss white laminate, set against sandstone-clad walls. Opposite this is the accent wall panels behind the gray sofa which are made out of horizontal planks of ebony laminates with aluminum channel spacers. This helps bring focus to the living area, and frames the space as well. This modern living room has a brighter, more cheerful feel to it as it combines various colors and textures. 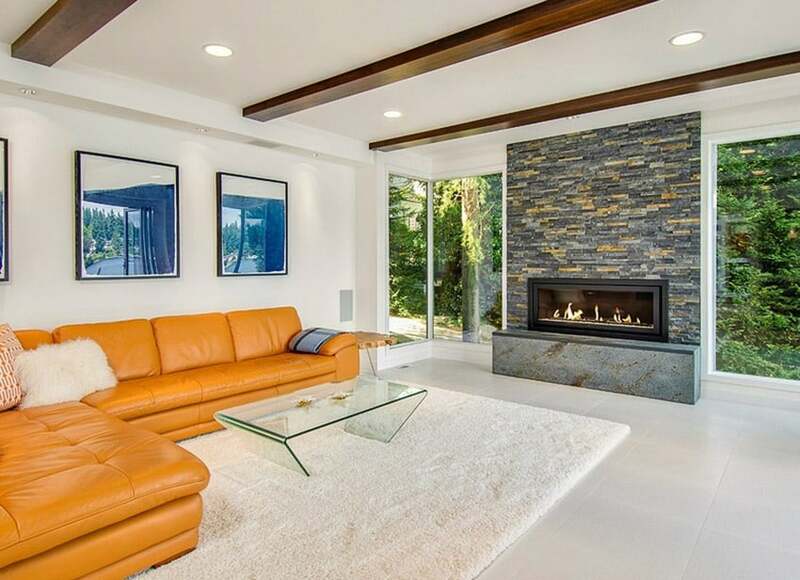 The bright yellow tones of its golden oak floors already give a bright mood to the space, but this is further combined with a bright orange rug with floral patterns, a light brown leather sofa with orange and indigo pillows and an accent wall clad with large river stones in a combination of white, indigo and orange. 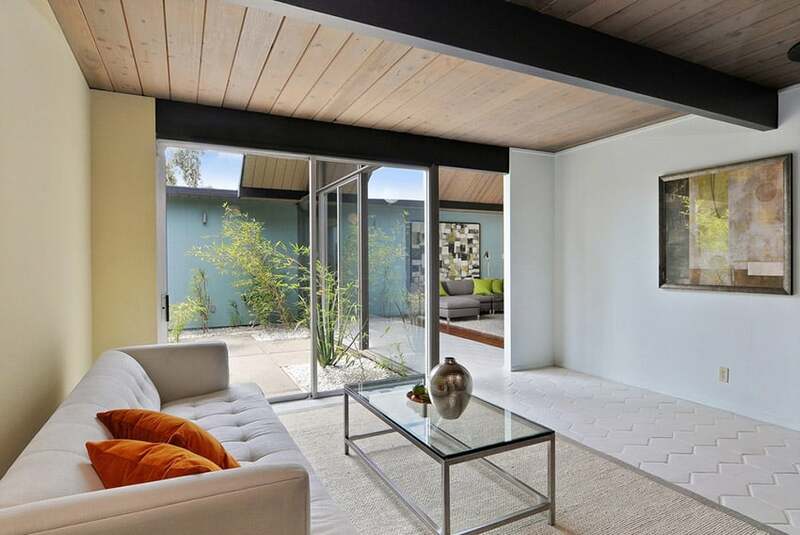 A lovely mid-century modern space which uses fun Scandinavian modern furniture with neutral and bright accent colors. In this example, there’s an excellent combination of texture and patterns, as well as a well-balanced color palette. There’s a brick wall painted in white, and a bright yellow wall with geometric mural art. The furniture pieces consists of two light mocha sofas and a pair of Scandinavian armchairs with a matching wood and glass coffee table. The combination of oranges, yellows and neutral colors give a fun and young vibe to the space, while maintaining a classy modern look. 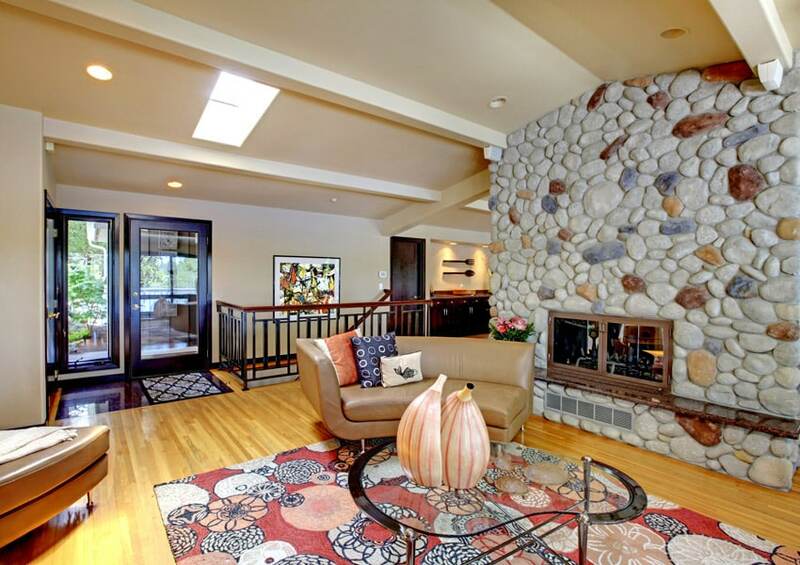 This formal living space is very spacious and well furnished, adapting a modern transitional style. The floors is a unique combination of ceramic tiles with wooden planks, creating a modern checkered pattern. 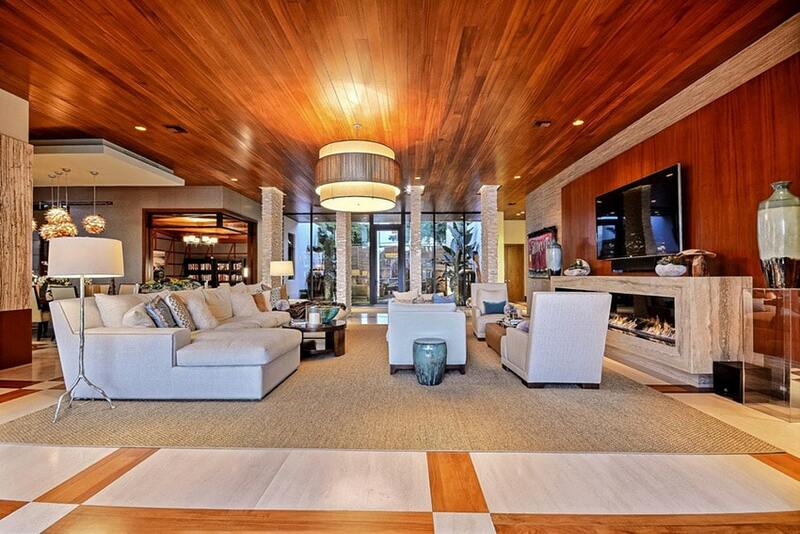 The large living area is framed with a natural jute area rug which helps the off-white furniture pieces stand-out. If you observe, all seats are matching, adapting the same style. creating a very well-put together look. This modern living room adds cool-toned accent colors which are a little subdued so as to keep the neutral look of the space. This spacious living room takes balance and symmetry seriously as it is furnished with a pair of brown sofas and another pair of white barrel armchairs. The perfect balance of the layout, the neutral palette of the space and the subdued accent colors creates a harmonious and relaxing atmosphere. 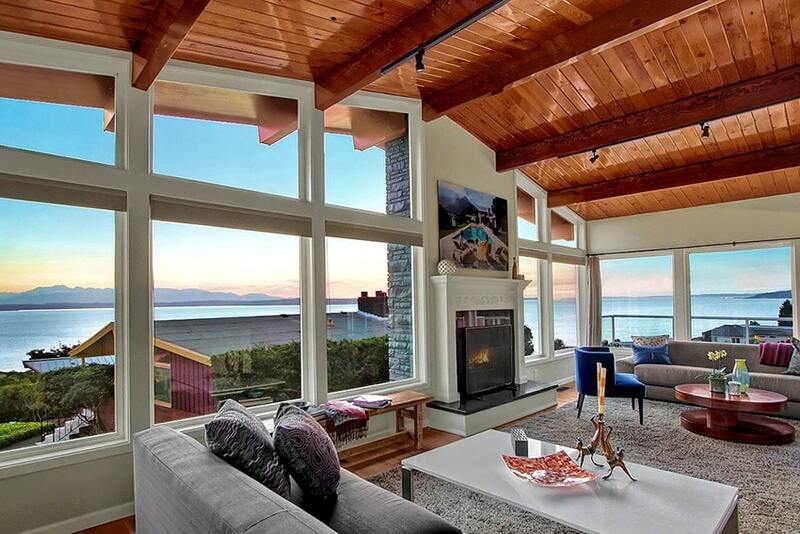 This transitional style living room has a fairly high ceiling, a fairly spacious floor area and large windows which opens up to a wonderful view of the sea. The high ceiling is finished with teak wood planks giving the space a relaxing rest-house-like feel. Modern furniture pieces were combined with transitional furniture pieces; a pair of modern gray sofa with a classic barrel chair reupholstered in a cobalt blue velvet fabric. This formal living area combines transitional style furniture pieces with modern wall finishes. There are two sofas upholstered in silver satin fabric with nailhead details, a pair of modern side tables and a mirrored coffee table. 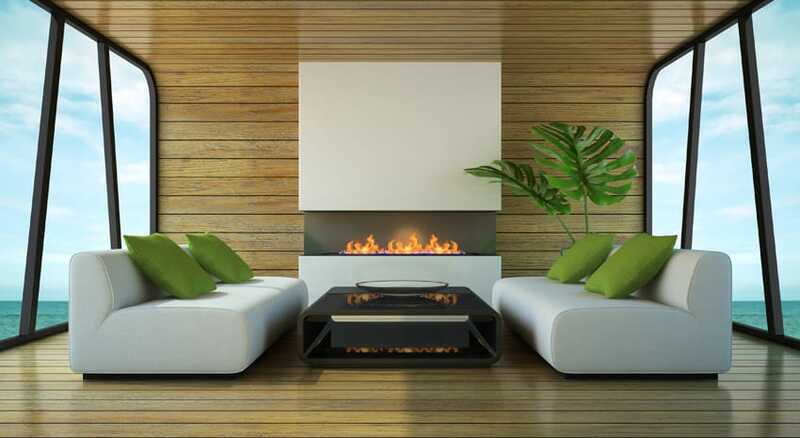 This is combined with a wood-laminated accent wall made up of horizontal panels, creating a simple but eye catching element to the fireplace wall. These horizontal laminated panels continues up to the ceiling which also helps emphasize the living area. 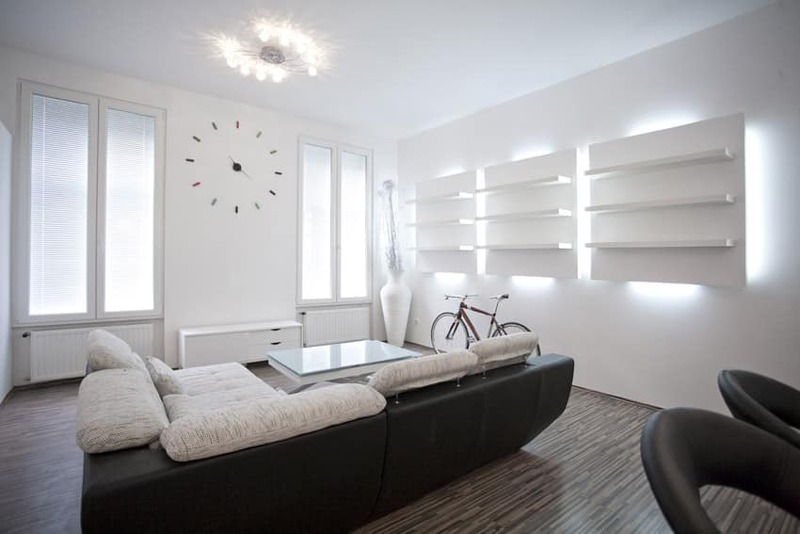 One of the main advantages of using plain white walls and ceiling is that you don’t have to worry about using bright bold colors for furniture and adding different textures to your space as the white surfaces helps balance out the bright colors and looks good in combination with basically any color. 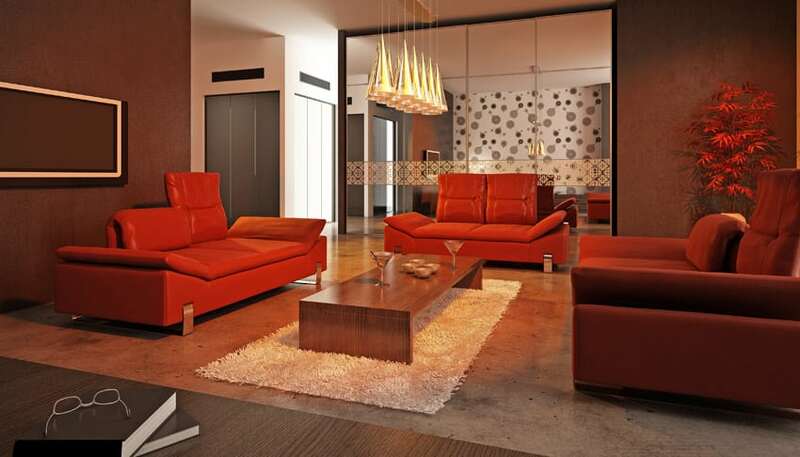 In this example, a bright orange leather-upholstered sofa was used, combined with glass coffee table and off white shag rug. There is also a set of bold blue modern artpiece which stands out well on the plain white walls. This is another Mid-Century modern living room which focuses on soft muted colors to create a relaxing and cozy atmosphere. Instead o flat whites, off-whites were used on walls and floors, combined with light cream fabrics like that used on the L-shape sofa. For the coffee table, a unique wood coffee table cut from an old tree was used, combined with a simple low white media console. The large wall art helps add a contrast of dark color to the space, balancing the over-all look. modern living room ideas that utilize wall art can help draw the eye upward which is especially useful in rooms with smaller layouts. 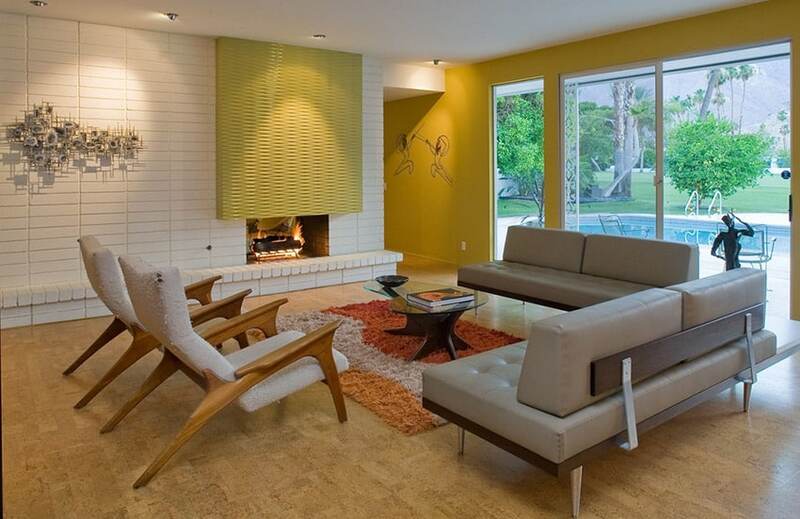 This spacious living room features an excellent combination of mid-century modern and modern minimalist aesthetics. Lines are crisp and sharp, with walls painted in plain white color, and the built-in cabinets are also in white. To add more warmth to the space, solid oak wood floors were used. A mid-century modern L-shape sofa in gray was used, along with a black leather accent chair, a modern white coffee table and a large brown area rug. 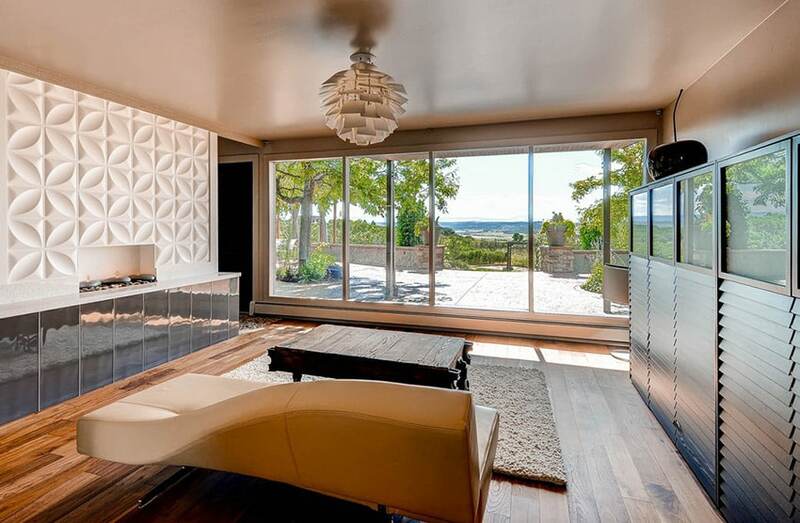 The back of the TV wall uses white 3D panels with a unique geometric patterns, adding texture and an interesting feature to the wall. This living room design combines modern furniture pieces with country style furniture, creating a unique, eclectic mix of styles. The white leather l-shape sofa, the matching ottoman, the stainless steel side table and the floor lamp are all very modern furniture pieces, but the media cabinet under the TV and the plant pots used beside it has a more rustic country appeal, using rustic finish wood instead of seamless laminate finish. The combination of rustic elements and clean modern lines is both refreshing and unique. Formal living spaces look even more elegant and grand when placed in a space with high ceiling such as this. The large open windows also helps improve the over-all feel of the space, creating a relaxing environment. The walls in this design are painted in a light oatmeal and the floors are light cream ceramic tiles. 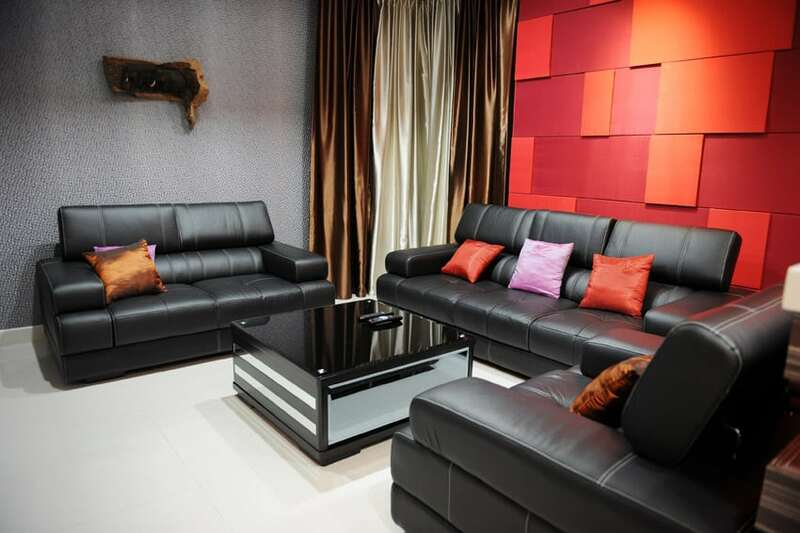 The furniture pieces used is a black leather sofa and two brown armchairs. 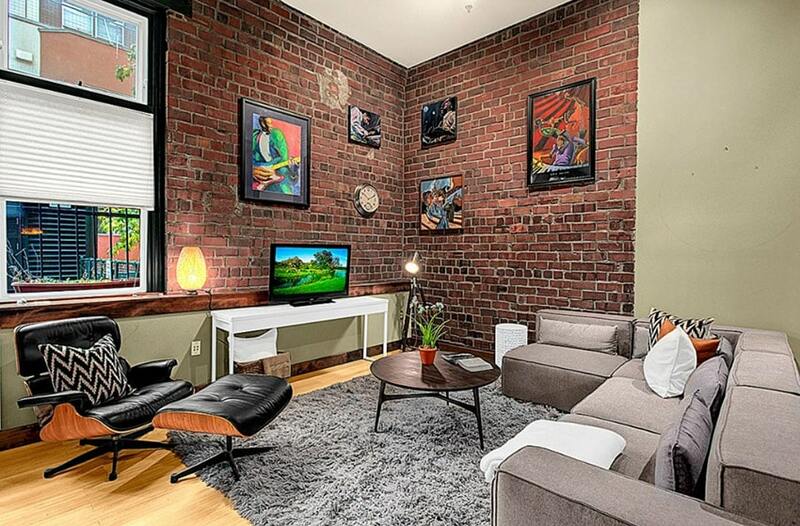 There’s also a recessed wall-mounted TV and a electric stove underneath. 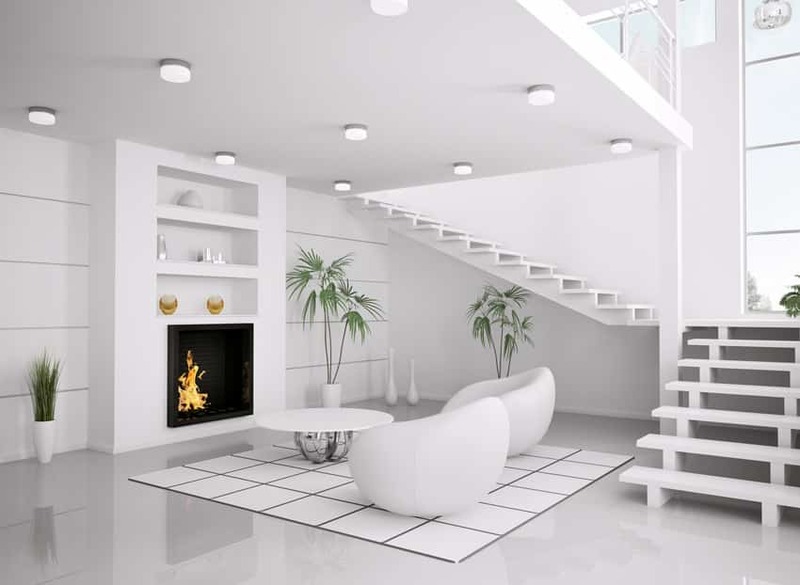 Modern living room ideas that go for an all white color scheme, can create a bright, clean and crisp-looking space. In this room walls, furniture and even built-in shelves are all in white, including lamps and even small items like the plant pot. Indoor plants were added into the space to give it a more natural feel, breaking the monotony of whites subtly. Some accessories placed are in black or dark wengue, helping add a contrast of colors to the all-white living space. 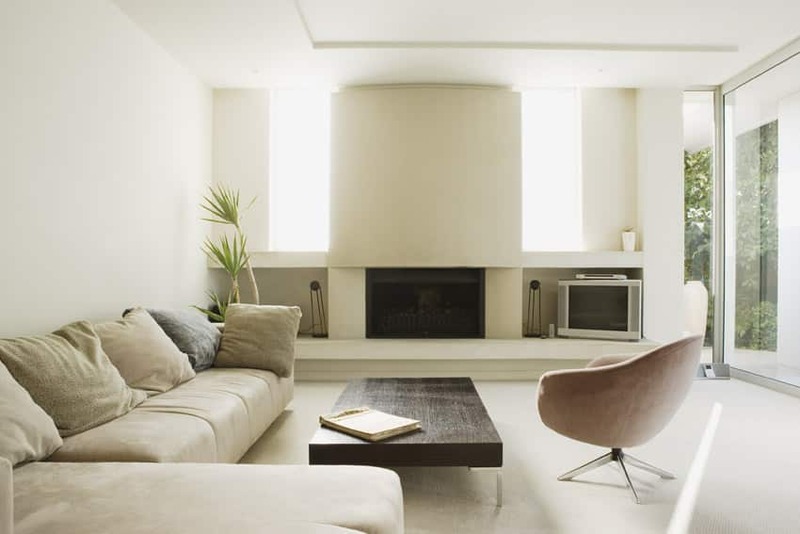 Using an all-white scheme for contemporary interiors is a safe choice, giving you a very bright and clean-looking space which could be a little tasking when it comes to maintenance. All walls, furniture pieces and even accessories are white, except the floors which used light gray tiles. 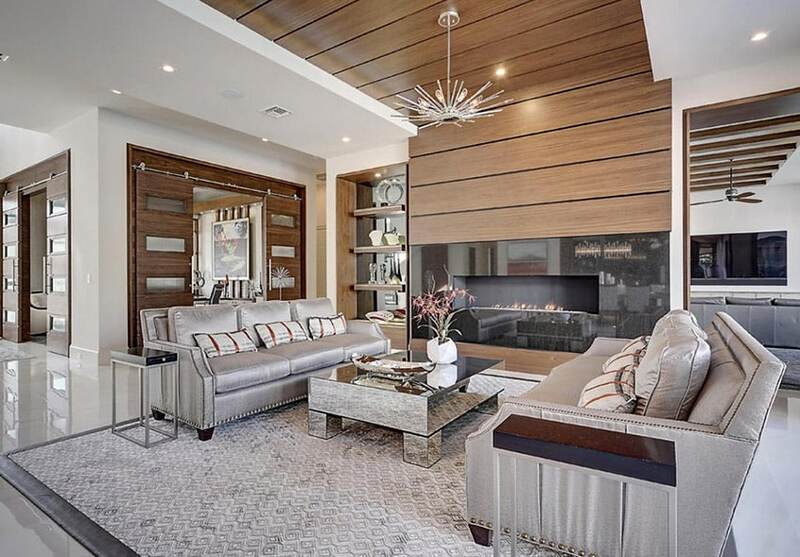 To help add more personality to the space, patterns were applied to some elements, like the horizontal panels on the fireplace wall and the square pattern on the area rug. Furniture pieces are two pieces of modern armchairs with a unique organic shape. Choosing an all-white color scheme creates a very bright and clean-looking space which also tends to have a more futuristic living room feel to it, especially when furnished with modern furniture pieces.In this example, you will see that all surfaces – walls, floors, ceiling and even the window treatments are all in white, including all furniture pieces, save for a few accessories and some indoor plants. 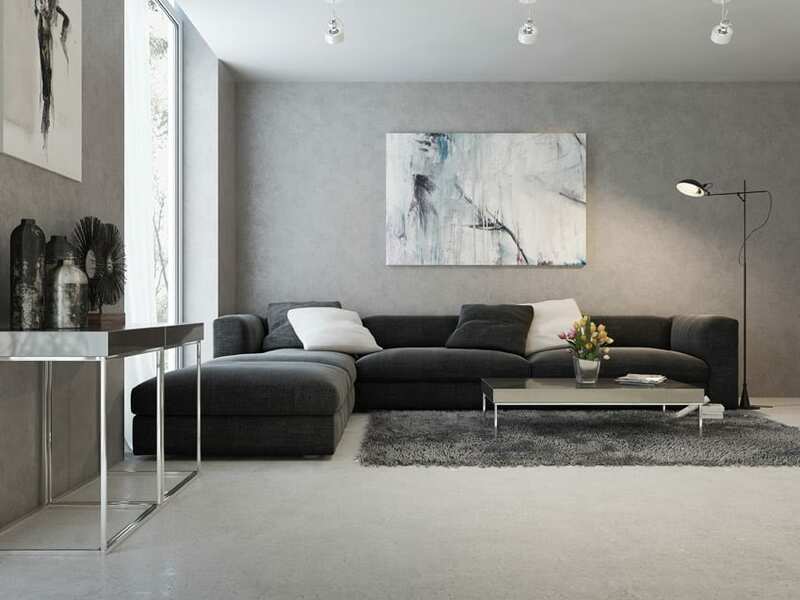 For modern minimalist-lovers, this living room design is a perfect choice. 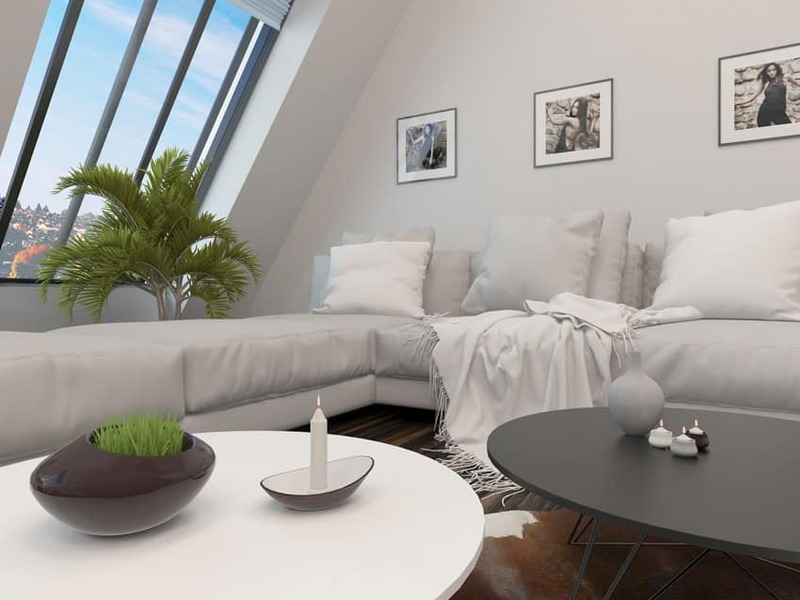 Modern living spaces often adapt very simple color palettes, and one of the most common choices is a black & white color palette as it is very flexible and timeless. 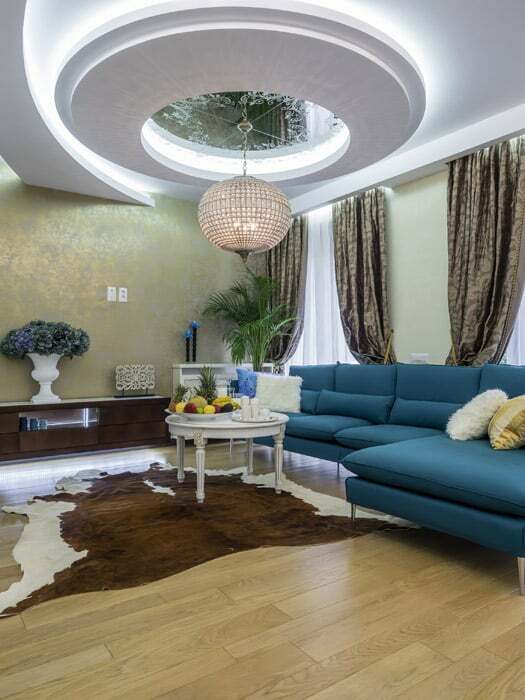 This living room design is one such example. It combines white walls with a black wallpaper accent wall, all-white furniture pieces, combined with stainless steel and black tinted glass to complete that modern look. Accessories’ colors are also often limited to black, white or silver to keep with the color scheme, creating a well-put together look. Apartments usually have very limited floor space, and that means furniture pieces you can put are often limited in number and in size. 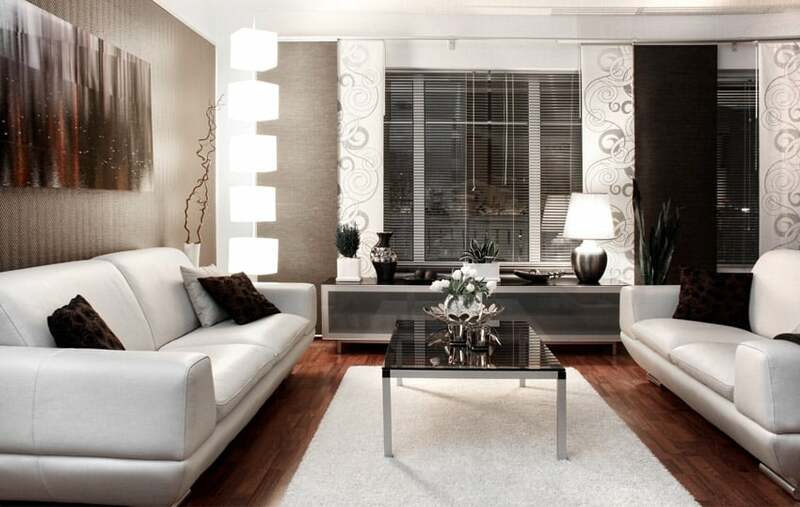 In this modern living room, a small white leather L-shape sofa paired with faux hide area rug are the only furnishings. This makes the living area look more spacious, as well as helpinng maximize the view as there are no pieces which totally blocks the two large windows overlooking the cit. Modern minimalist living rooms often stick to a very simple color scheme such as this example which uses a basic black & white color scheme. 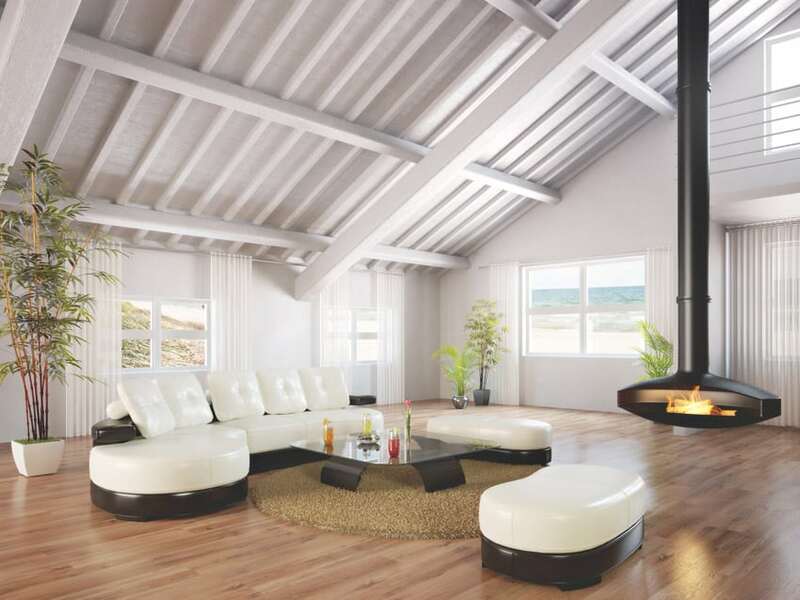 Wooden floor boards were painted in white to match the white walls and ceiling, while the floor to ceiling doors and windows uses black aluminum framing. The TV wall has an accent strip of black padded fabric on the wall which also helps improve the acoustics, and for the furniture, white leather-upholstered sectional sofa and a matching coffee table was used. This is another modern minimalist living room design which uses a black & white palette over the more popular black & white color scheme. Walls and wall shelving units are all in white, combined with brown flooring, a sectional sofa upholstered in brown leather & light beige fabric and two brown leather bar stools. 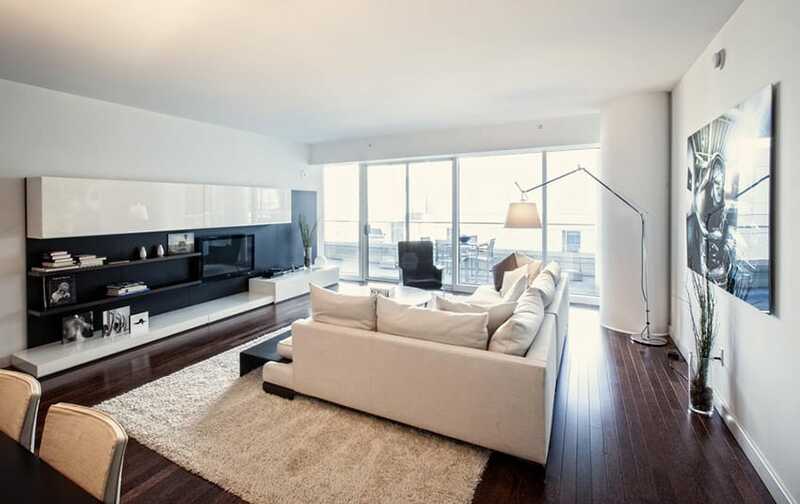 Contemporary homes adapting a darker color scheme often have that sleek & sophisticated appeal, such as in this example. This living room is very simple and furnished with only the essentials, yet it manages to achieve a complete and balanced look. Large glass doors/windows with black frames was paired with black accent wall and white floors, creating a neutral ye contrasting background. For the furniture, there is only one L-shape sofa in gray linen upholstery and white organic shaped coffee table framed with black area rug. 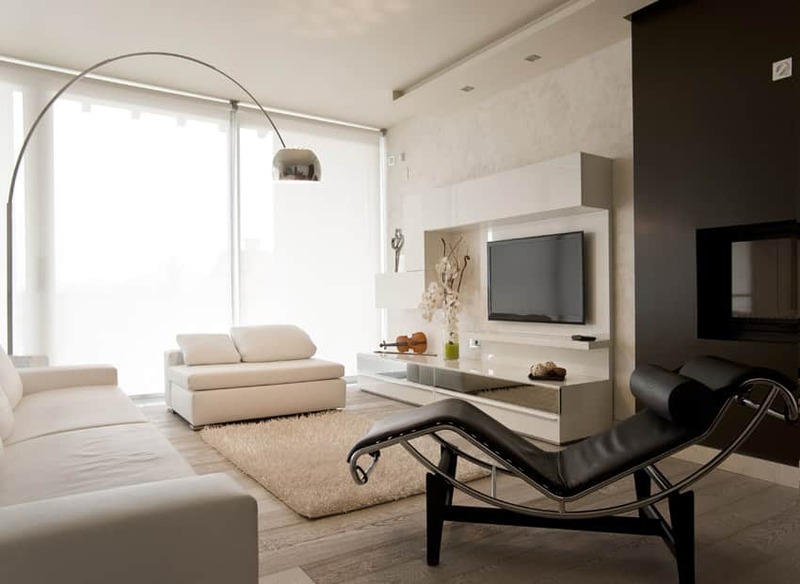 A minimalist modern living room which has a simple black and white color scheme combined with dark mahogany wood. It is a fairly spacious living room, but is only furnished with essential pieces in order to make it look bigger. Furniture pieces include an L-shape sectional sofa with off-white linen upholstery, a low coffee table, a classic high back armchair with black leather upholstery and a media cabinet in a combination of matte black backing, glossy white cabinets and dark mahogany shelves. This modern living space combines both modern and rustic elements as it also effectively unifies the look of the outdoor and the indoor space. The living area has an average floor and adapts an open layout. The floors are light gray concrete and walls are plain off-white. There’s an accent panel walls with Teak wood laminates where the TV was mounted, and the furniture pieces used is a pair of arm-less sofas in gray velvet fabric adding a soft texture to the space. The wood element of the accent wall matches the rustic wood sidings used on the patio area, creating unified look for the two spaces. Dominated by blacks and brown tones this living room has that sophisticated modern feel, creating a very elegant yet simple living room design. Floors are textured ceramic tiles in light gray, and walls are mostly clear glass windows opening into the garden and framed with wooden columns and framing stained in ebony black. 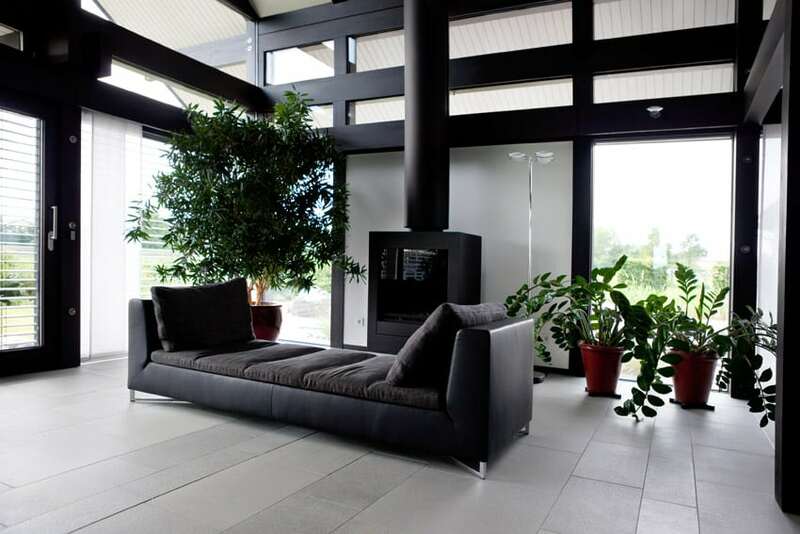 There’s only one white wall which is behind the free-standing fireplace, and is surrounded by various indoor plants. For the furnishing, despite the large space, it only has one black bench in the middle. Adding a little texture to your walls helps add more depth and personality to your space. In a modern living room especially, it helps add a little more interest to the space without overpowering other elements of the space. In this example, antique bricks were placed on the accent wall behind the black & white sofa to add texture to the plain white walls. The bricks and the Moroccan border tiles on its sides also gives a little tropical/Asian feel to the space without having to change the black & white color scheme. 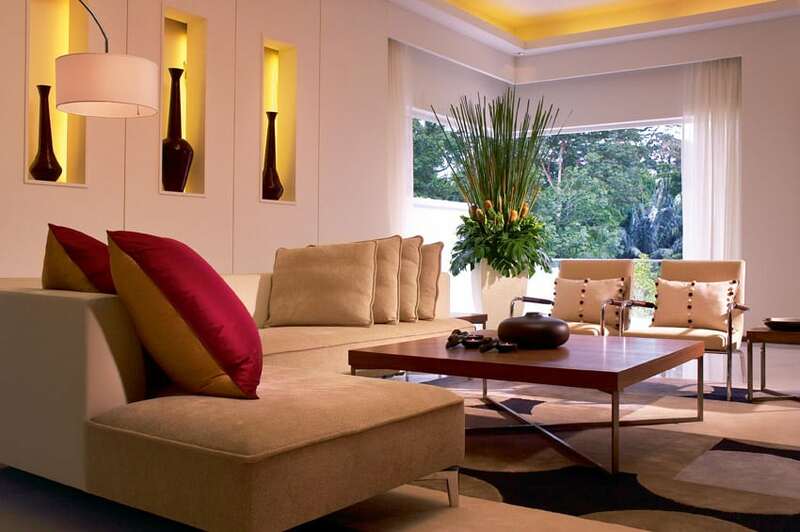 A modern Asian living room design combining light colors with wood and other earth tones. Floors are dark Cherry wood contrasting against the off white walls. 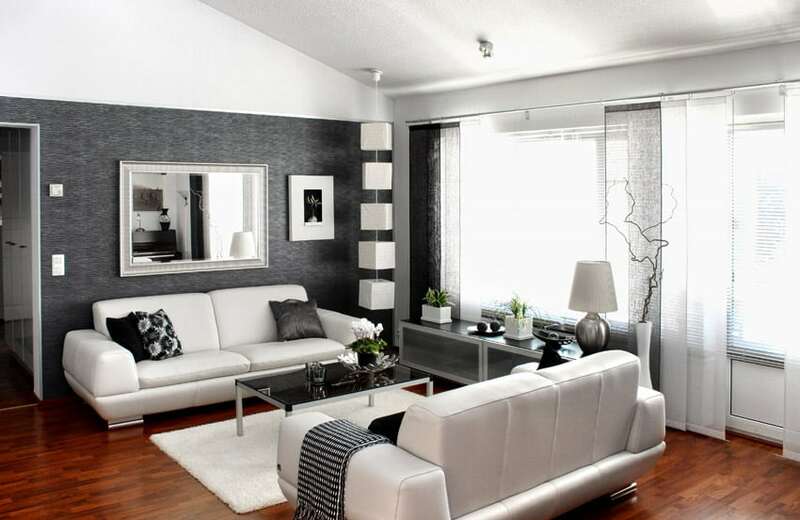 Behind the white leather-upholstered sofa is an accent wall with wood laminate cladding, shelves and accent artwork. The curtains and the valence board uses the same fabric which has a more neutral tone compared to the pillows and wood laminates used. 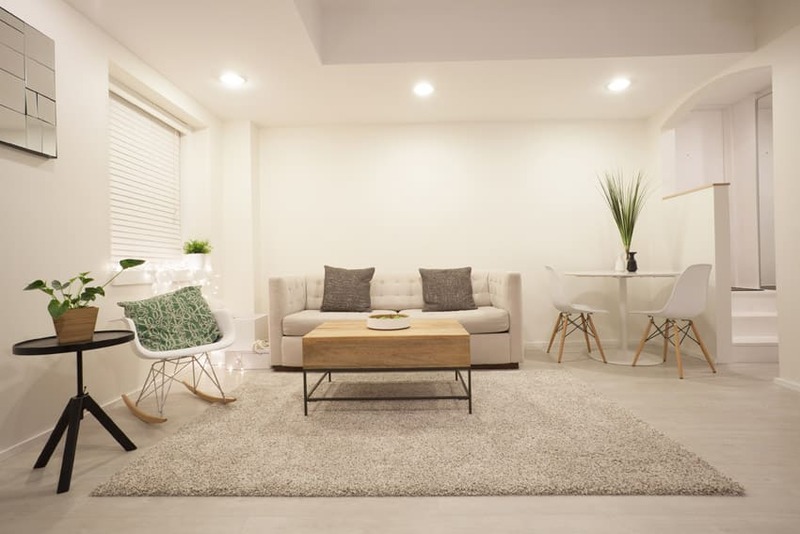 To complete the Asian look, in the middle of the large white area rug, a low collapsible coffee table was used along with some pillows for sitting. Another 50’s inspired modern living room which uses a combination white, black and red for its color scheme. Walls were kept plain white to go along with the cream colored tiles. 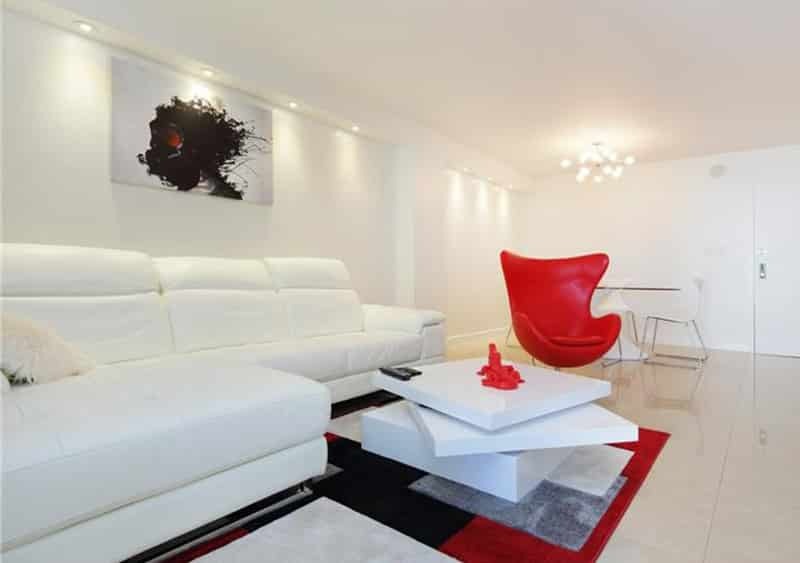 The living area has a large white leather l-shape sofa and an iconic red Egg Chair as an accent piece. There’s also a unique white coffee table with a rotating top. Going for a contemporary zen look, this living room boldly paints an accent wall in red, making it the focal point of the room. This red wall also helps bring out the black and white sofa. Aside from the sectional sofa, this living room also has a matching pair of ottomans stowed under two low coffee tables. Other Asian zen design elements include indoor plants and symmetry as demonstrated by the wall art installation above the sofa. Modern living room ideas that go for bold colors such as red won’t appeal to all home buyers, however they definitely evoke emotions and make a statement. This living room has a very modern & casual appeal. Using a set of comfortable reclining leather seats in black, paired with black glass coffee table, the set up is very simple and minimalist. To give more life to the space, one wall uses a textured wallpaper in a dark blue-gray color, while an accent wall with orange and red-orange acoustic panels was used, adding depth & color to the space. For a more cozy feel, this modern living room uses a darker color palette. The floors are gray polished concrete, paired with walls with mocha brown textured wallpaper. Mirrors were also used on the walls to enhance the space, making it look bigger. For the furniture pieces, a matching set of three sofas were used, all upholstered in red, giving you lots of sitting room. Sitting in the middle of the three sofas is a modern rectangular coffee table in wood laminate finish. 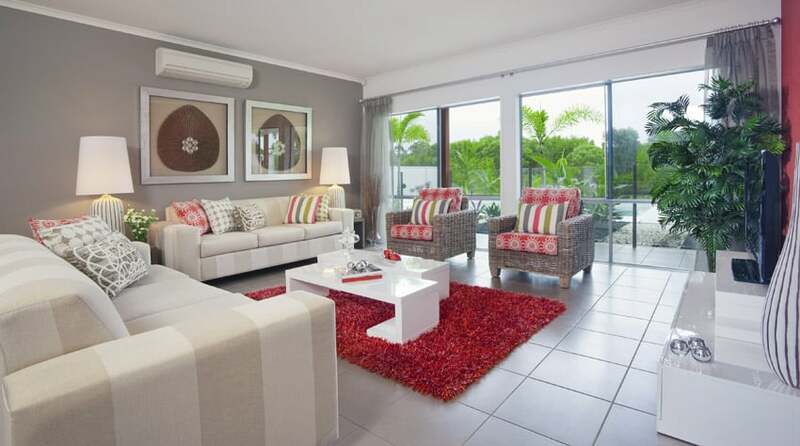 A modern living room which has a fun summer feel as it combines bright colors with warm neutrals. You will see that the walls and floors are mainly white, with a light beige accent wall. The living room is furnished with two striped white and beige sofas and two rattan armchairs with red printed seat & back cushions. There are also other colorful pillows used on the sofas, and even a red shag rug, creating a bright and summery mood to the space, enhanced by the use of indoor plants as well as the visibility of the garden from the living area. 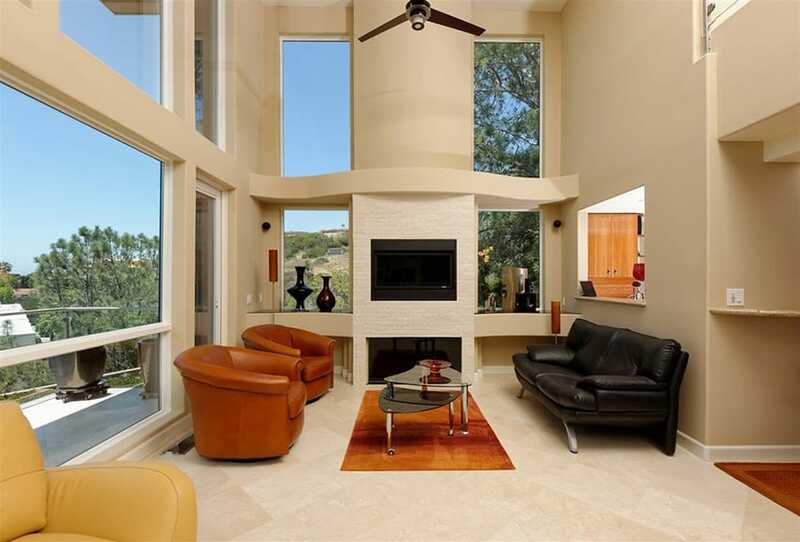 This is a very spacious living room with a three floors high ceiling. It is able to fit two identical living areas, one inner living area and a grand piano, but still maintains a spacious and large open floor area. The architecture of the space is very modern – it uses white floors and simple white walls with no moldings, floor to ceiling height windows which brings in pleasant amount of natural light, which sets up a nice clean background for your furniture pieces. The minimalist architecture of the space was combined with an eclectic mix of furniture pieces. There’s a modern white leather sofa in a quarter circular shape, a pair of barrel armchairs with stainless steel arms and brown leather upholstery, wood coffee table, a bold red high pile rug and a unique stone side table. This small has a simple, clean & crisp look so as not to overwhelm the small space. It uses a simple color scheme of light gray and white and produces a balanced modern look. Due to space limitations, the room is furnished with essential pieces – an l-shape sofa, a pair of low coffee tables in white and gray and an indoor plant helping improve indoor air quality. This living room might be small, but it packs a lot of personality and attitude. It combines plain light gray walls with terracotta brick walls, adding a rustic appeal to the modern space. For the furniture, a large gray sectional sofa was used and combined with an Eames Lounge chair & ottoman, a modern classic piece. The walls also feature various modern artworks that helps give a youthful casual vibe to the space. Facing a wonderful outdoor view, this small living room is perfect for lounging and relaxing. The natural pine floors sets a warm background, adding a natural tropical feel to the space despite the very modern sofa used. This is combined with antique coffee table and a plush area rug in off-white. It also has a louvered storage cabinet on the right and white 3D panels on the left creating an very interesting geometric pattern on the wall. 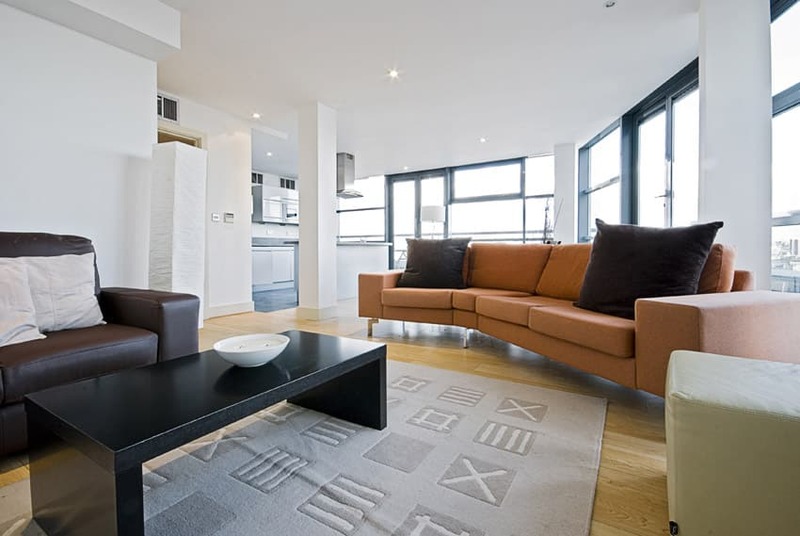 Modern living room ideas can be challenging when you are designing for a smaller space. 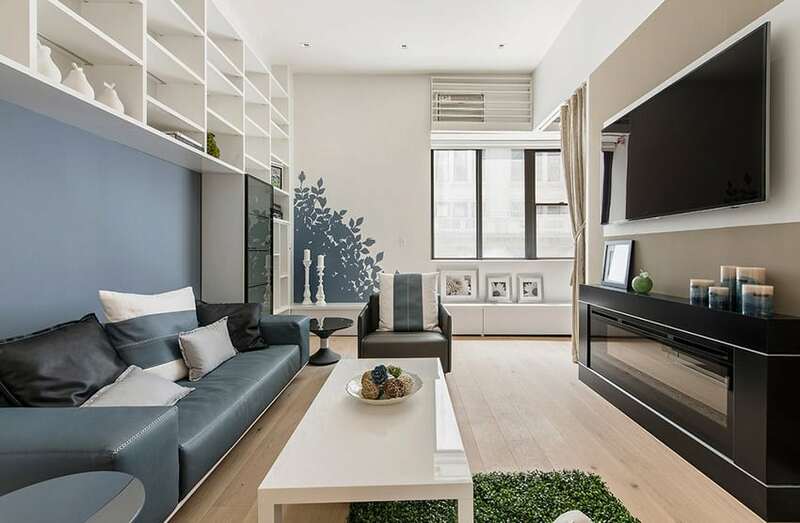 This small living room combines slate blue with the usual black and white colors common on modern design. The floors are lovely solid maple wood adding a touch of warm glow to the space. Walls are mostly off white, with slate blue and mocha accent walls behind the sofa and the TV respectively. Storage is maximized in this design, using most of the available wall space for shelves and cabinets. For the soft furnishings, a simple slate gray leather sofa and a black leather armchair was used along with a white coffee table. The combination of the soft yellow walls and the light maple wood used on the ceiling gives this small living space a warm and relaxing feel. The black beams helps add contrast to the space,while the hexagonal pavement tiles and the jute area rug adds texture and pattern to the design. Given the small space of this room, it is simply furnished with a light cream sofa with tufting and a stainless steel coffee table with tempered glass top. When coming up with modern living room ideas for a small space it helps to keep things light and if possible decorate the space in a way that draws the eye upward.